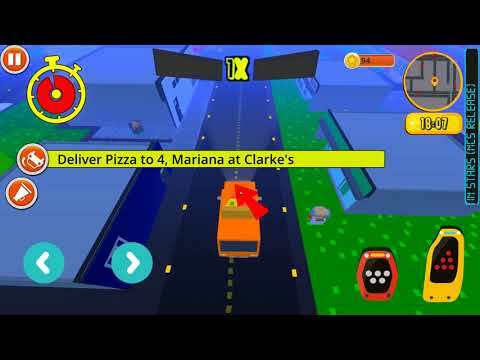 Crazy Pizza Boy is a open world endless pizza delivery game , which uses spectacular graphics and amazing audio effects to give breath taking game play experience. Crazy Pizza Boy is a fast paced action / racing game in which you will have to race against time to deliver pizzas, make your way through city traffic as your tyres burn against the asphalt. The game also features mind blowing audio - visual effects that improve the game play beyond the ordinary. We don't believe in restricting you to limited environment , hence the city is open for you !! You can make your own path towards your goal. The game also features 3 different controllers , so play comfortably according to you ! There are 3 power ups available to help you in your mission to serve delicious pizzas to everyone. 1. Beat Detection: The game features an amazing beat detection algorithm , where lighting of game is affected by the song that is playing !! 2. Open World: The game is open world , and the path to deliver pizzas is yours to make. 3. Upgrades and Powers: The car is upgradeable with several upgrades, there are also 3 power ups : Nitro, Slow - Motion and Jump to help you in your missions!! 4. Different Controllers: The game can be played with 3 different controllers : Steering , Buttons and device Sensors. 5. Amazing Music: The game also contains several music tracks to make your game-play experience like never before ! 6. Tons of Achievements: The game features tons of achievements to earn coins, which can be used to upgrade the car. 7. Free Roam Mode: Are you tired of playing missions and just want to roam in the city ?? Well you can , the game also features a Free Roam mode in which you can roam in the city , enjoying music ! 8. Day and Night Cycle: The game features a complete day and night cycle so that our mission to serve the city never stops! 9. Realistic Physics: The game runs on very realistic physics and almost every object in city can be kicked around ! 10. More Destruction: Create chaos in city as you move around by destroying vehicles and knocking civilians ! 11. Amazing Driving Experience: The pizza van drives like a real car and is fun to drive around. So, grab Crazy Pizza Boy now and play the best pizza delivery game EVER !!! Stay tuned for upcoming updates and do let us know how much you liked the game.